… you are going to love the fall 2016 / winter 2017 line-up. There is not one, not two, but THREE models for you to consider, as you look into a replacement or an upgrade. Get out your Christmas wish list. You will want to add to it. 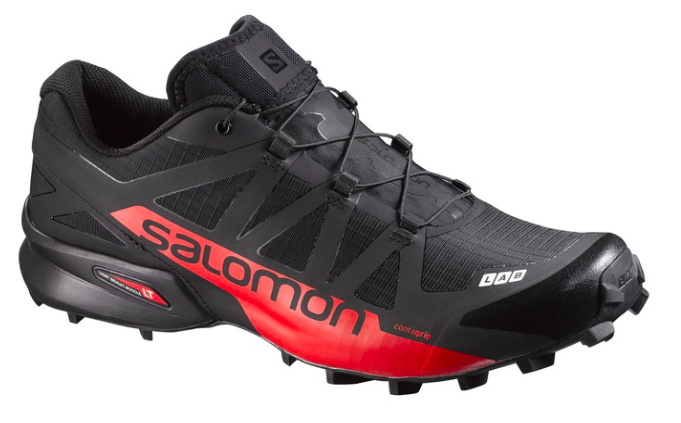 This is perhaps Salomon’s best selling shoe. 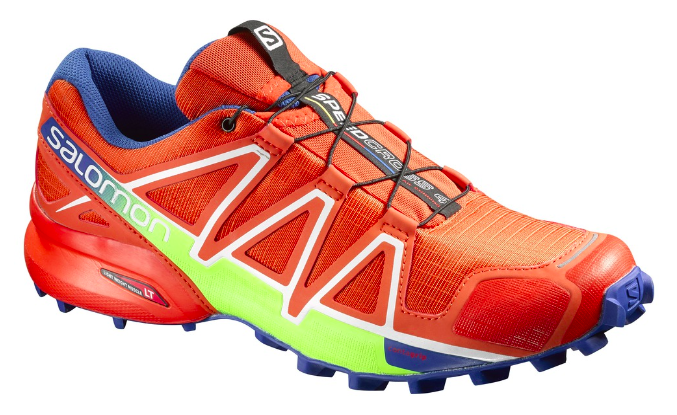 It is definitely Salomon’s best selling shoe, when it comes to obstacle racing. This fall brings the model’s 4th reiteration (SpeedCross 3 has been around since 2012). For purists. If you love your SpeedCross HARD, chances are, you will go for a model upgrade, and nothing else. You will, of course, enjoy the pretty new colors – but those you get every season. The biggest change comes to the shoe’s lug system – a tighter lug pattern, that offers even more grip, and complete arrow-shaped lugs along the side, instead of half arrows on the previous model. 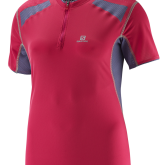 Top – SpeedCross 4. Bottom – SpikeCross 3 (same bottom as the SpeedCross 3, except for metal spikes). The lug material promises to be more durable as well, which is ideal, if you can’t stop yourself from wearing SpeedCross on pavement (a waste of a shoe, if you ask me, but hey…). Note that both CS and GTX versions WILL be heavier, and, as an obstacle racer, you should probably steer clear of both of those anyway. Your feet will get wet. Make peace with it. I am quite excited about this option. If you have been hesitant in the past to step away from the classic SpeedCross, this may be a great shoe to play with. It is still very recognizably SpeedCross, but offers few subtle changes. The fit is a bit more narrow, hugging the foot more tightly. Slightly less drop, but still plenty of support. And, perhaps, the biggest difference – the upper has NO stitching, but laminated seams instead, which results in a more water repellent shoe. A SpeedCross addition to the S-LAB family. Yessss! 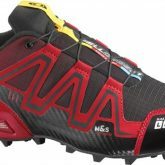 I am a big fan of S-LAB collection – Salomon S-LAB Speed and Salomon S-LAB Sense 5 Ultra SG (oh god, this one is really a mouthful, eh?) are some of my favorite racing shoes. This is also the newest model, and most will have trouble making a decision between this guy, and SpeedCross Pro (which came out earlier as an in-between model). 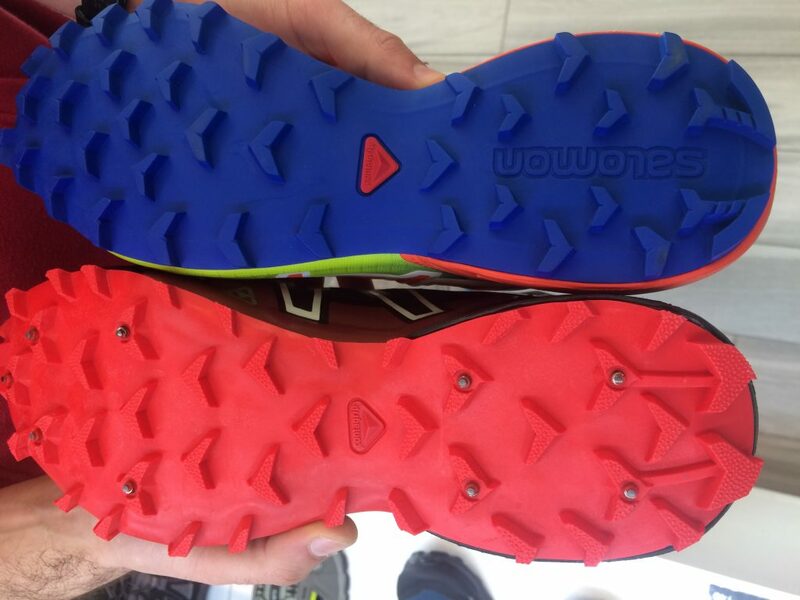 This is a gutted SpeedCross 4, and is meant to be the racing shoe for SpeedCross fans. It sacrificed a bit of cushioning (3mm less in drop) for that more aggressive and light feel. 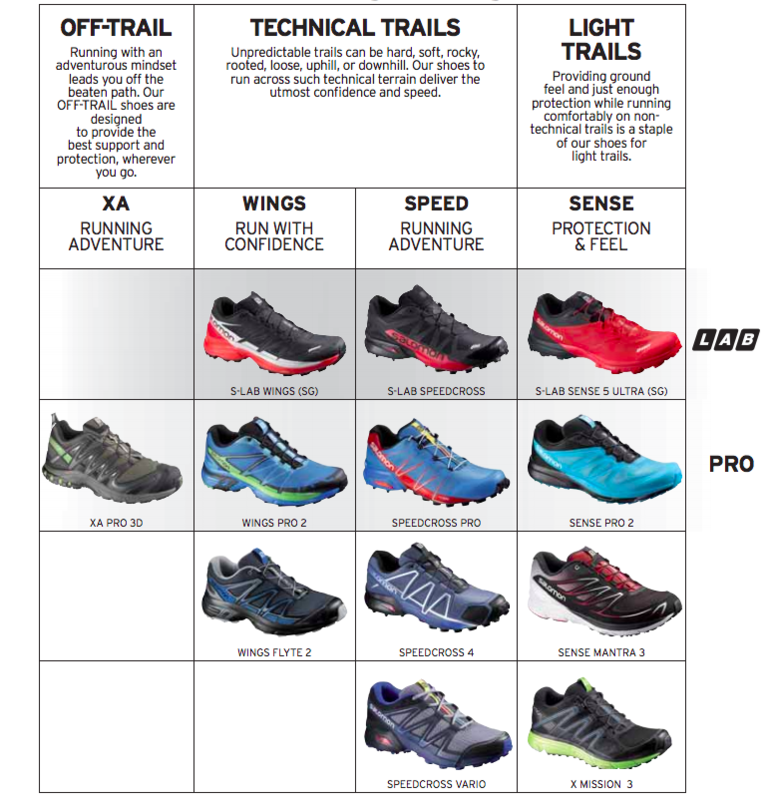 Here’s a quick (albeit incomplete) model summary from Salomon, varying in support and weight, from off-trail heavier models on the left, to lighter racing models on the right, giving you an idea of how different iterations of SpeedCross fit within other models. I’d argue that most obstacle racers will stick to the SPEED column – hence, SpeedCross options. XA PRO 3D is a great hiking shoe, but way too heavy to run in. And while many folks love the Wings line-up (in which case, you will be tickled pink with some brand new options this season), I have always found them too bulky. 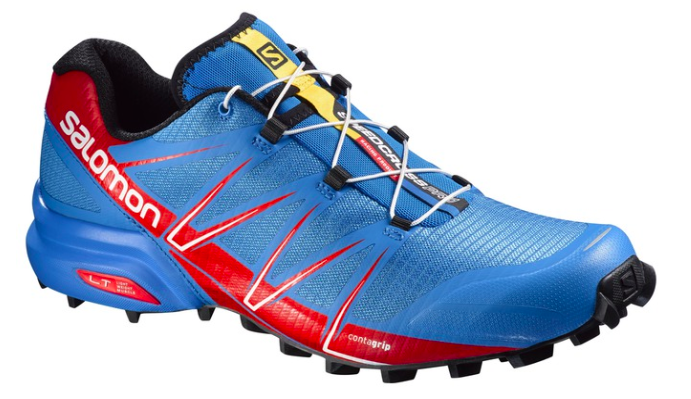 More experienced runners will venture into the SENSE category – hello, S-LAB Sense 5 Ultra (SG)!, although Sense Pro and Sense Mantra are not going to provide enough grip on technical trails, and are better used for road-to-trail and well-groomed trails. Looking forward to giving some of these a whirl.